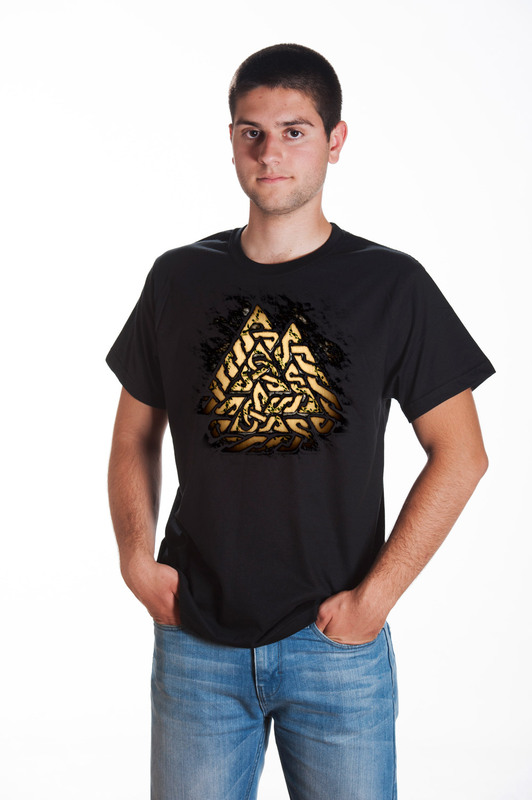 Valknut of Odin Designer T-shirt. 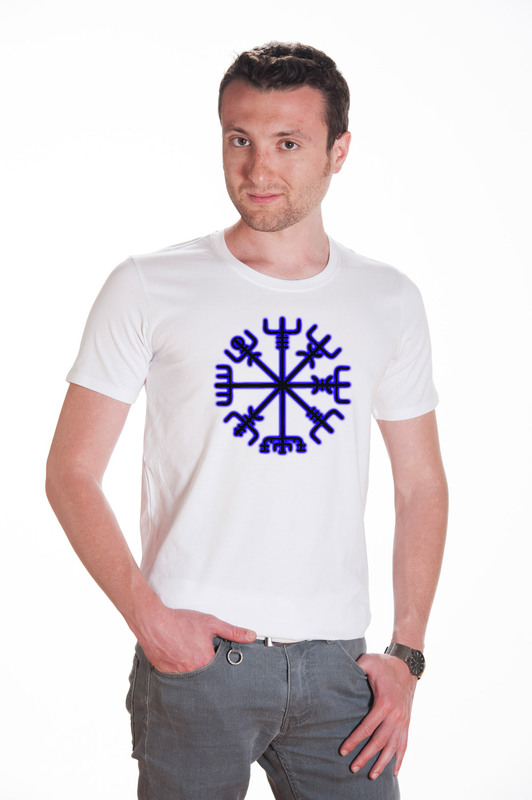 For all the people who love Norse Mythology - this t-shirt is perfect for you. 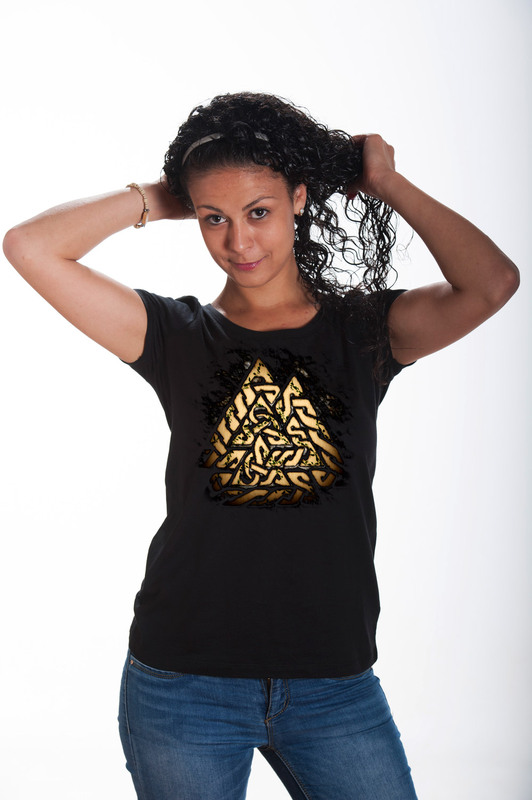 The Valknut, is one of the most traditional symbols associated with the Norse God Odin. Since ancient times this symbol has been used throughout Europe in association with the God known as the All-Father, the God of Poetry, the God of Warriors, a God of the Dead, the God of Magic and Runes, the God of Wisdom, a God of Ecstasy, etc. Similar symbols were used on cremation urns by the Anglo-Saxons, or found on memorial or rune stones like the Tängelgarda Stone and Stora Hammer stones found in Gotland, Sweden as well as found among the artifacts at the Oseberg Ship burial find in Norway. The term valknut is a modern invention, deriving from the combination of two Old Norse words: ‘valr’ (slain warriors) and ‘knut’ (knot). There are two kinds of valknuts, the unicursal, which is one continuous ribbon knotted upon itself, and the triple version which is made by entwining three separate triangles. The valknut is used today as a symbol first and foremost of Odinic worship by those who honor the Norse God Odin, and also as a symbol for those who honor the Aesir, the ancient Gods of the Germanic & Scandinavian peoples, such as Heathens, Germanic Pagans, Northern Tradition Pagans, Anglo-Saxon Reconstructionists, Asatru, Odinists, etc. The cumulative sum of all three triangles’ sides (nine) represent the nine nights that Odin hung on the World Tree Yggdrasil. The World Tree, Yggdrassil, in turn connects to all nine worlds (Midgard, Musplelheim, Niflheim, Asgard, Vanaheim, Jotunheim, Swartalfheim, Alfheim, and Helheim) of this tradition’s cosmology. Also the knot of the slain often is connected to Odins’ power to bind and unbind. Hilda Ellis Davidson writes in her book “Gods and Myths of Northern Europe”: “Odin had the power to lay bonds upon the mind, so that men became helpless in battle, and he could also loosen the tensions of fear and strain by his gifts of battle-madness, intoxication, and inspiration.” The symbol is also connected to the dead, more precisely those of them chosen by Odin to live in Valhalla. It is said that the Allfather marks their souls with a valknut to help the valkyries to find them more easily on the battlefield.